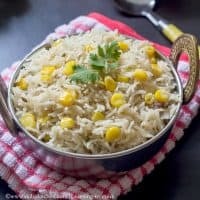 Sweet Corn pulao is a easy and tasty North Indian one pot meal which can be prepared in morning hurry burry and can be given as a lunch box recipe to your kids and hubby. Sweet corn pulao recipe with easy step by step instructions for your easy understanding and learning. 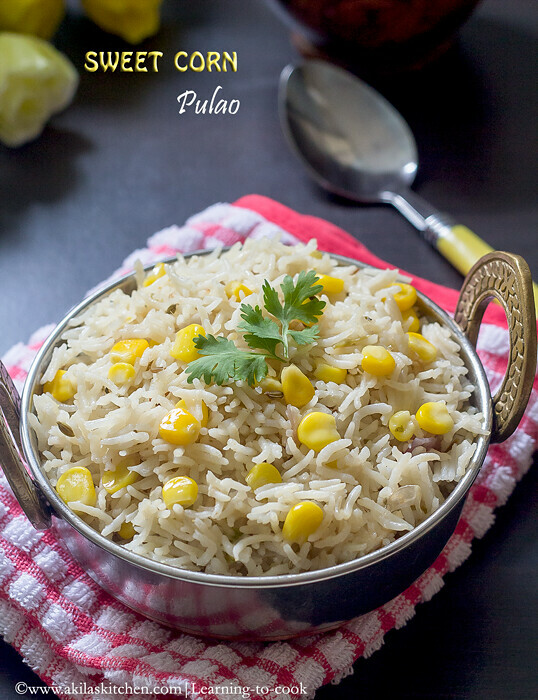 Sweet Corn Pulao is an easy pulao recipe next to the Peas Pulao and Jeera Pulao. If I am in a hurry or lazy to prepare any South Indian traditional kuzhambu varieties, then I go for preparing the Pulao recipes. 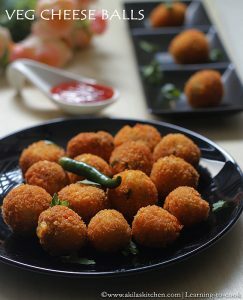 Since this is mild spicy, any kind of spicy side dish like spicy meal maker gravy goes very well with this pulao. I am planning to try more different variety of Pulao as it is easy to prepare one pot meal and tastes great. 1. Soak the rice for 20 min. In a pressure cooker, add oil and when it is hot, add the spices and fry for a min. Add the onion and fry till soft. Add the ginger garlic paste and sauté till the raw smell goes off. 2. Add the green chillies, coriander and mint leaves. Sauté it well. Add 1tsp ghee and the rice and fry for 2 min. Add the required salt. 3. Add the sweet corn and water. When the water boils, close the lid and cook in low flame for 10 min. After 10 min, open the lid and the remaining ghee and slowly mix it well, without breaking the rice. Again close and keep it for 5 min and serve hot. 4. Yummy Pulao is ready. I served it with crunchy capsicum raita. 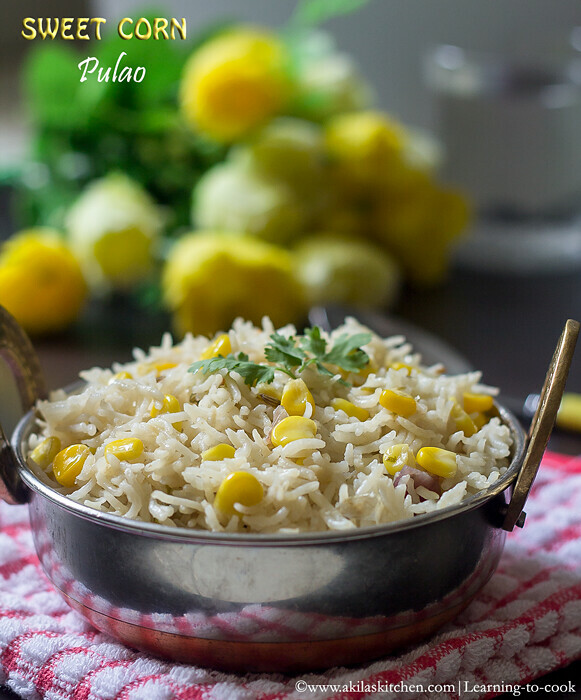 Sweet Corn Pulao is an easy pulao recipe next to the Peas Pulao and Jeera Pulao. If I am in a hurry or lazy to prepare any South Indian traditional kuzhambu varieties, then I go for preparing the Pulao recipes. Soak the rice for 20 min. In a pressure cooker, add oil and when it is hot, add the spices and fry for a min. Add the onion and fry till soft. Add the ginger garlic paste and sauté till the raw smell goes off. Add the green chillies, coriander and mint leaves. Sauté it well. Add 1tsp ghee and the rice and fry for 2 min. Add the required salt. Add the sweet corn and water. When the water boils, close the lid and cook in low flame for 10 min. After 10 min, open the lid and the remaining ghee and slowly mix it well, without breaking the rice. Again close and keep it for 5 min and serve hot. 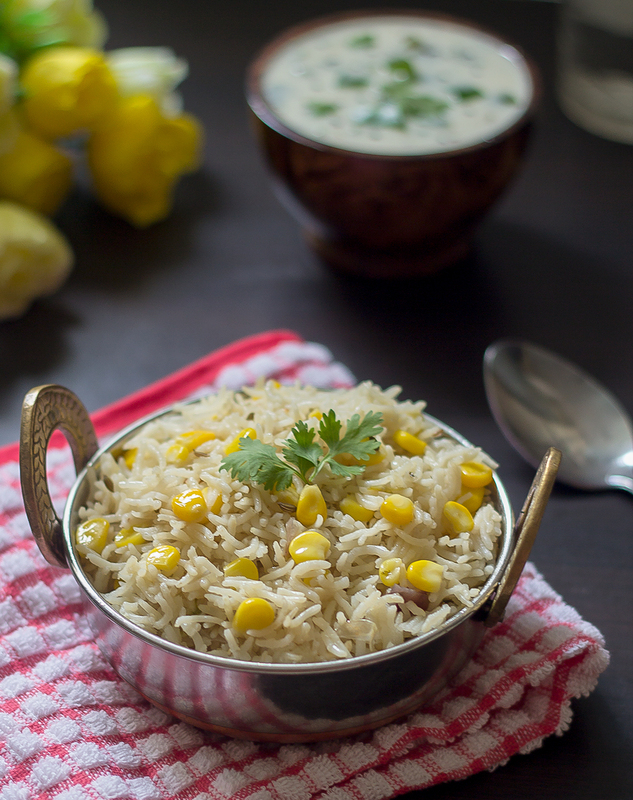 Yummy sweet corn Pulao is ready. I served it with crunchy capsicum raita. Soaking the rice, makes it lengthier and softer. you can also fry the soaked rice in ghee for about 2 to 3 minutes. *Post first published on Oct 28th 2014. Updated with Recipe. This whole some meal is so good. the pulao looks very colourful and tempting. Lovely photos.